Benbulben Show, 4th May 2014. Well done Team Donegal! 3 minutes. The time limit set by Micky for the length of a serious conversation during the 3 hour journey down to Benbulben Riding Club’s Show/ Masters Series Qualifier, which John, Micky and Rosaleen travelled to yesterday. Need I say anymore – the entertainment in the lorry ensured the journey up and down was all part of the days craic, and even though Micky wasn’t impressed with John’s driving skills, Rosaleen was reluctant to take over the wheel. However by the time Micky got back to Creeslough, he had to concede that John was some driver. Well done to Benbulben for putting on a great show. While what was without doubt, a very strong and challenging course, with very few clear rounds, all 5 Donegal riders had fantastic rounds and jumped clear. 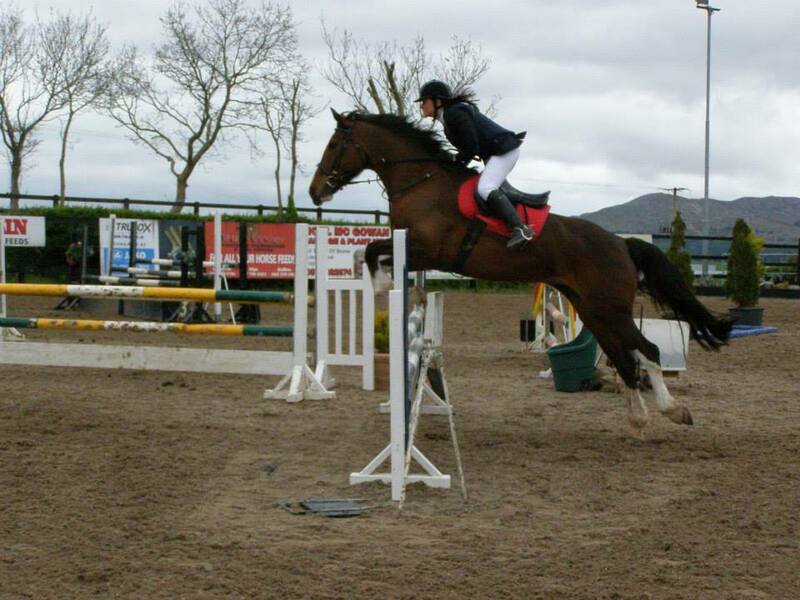 Mona Vial from Tirconaill RC was the first Donegal rider to compete, and had a superb double clear, placing her 3rd in the Advanced Primary Class. Mona also had a very successful 5th place in the Primary/Adv Primary Derby Class. 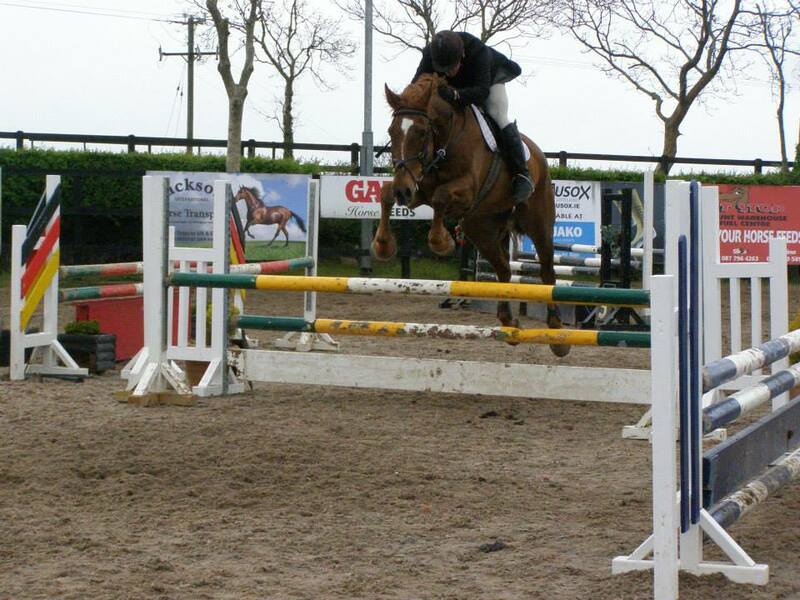 Next up was the 90cm clear round jumping, and Rosaleen, John, Micky and Charlie all had excellent clear rounds. A large Intermediate class with 40 competitors followed suit, with only 10 riders making it through clear to the jump-off. Unfortunately for Charlie, he incurred 1 time penalty for being 0.95 seconds over the extremely tight time limit, after having what was otherwise a great round. Micky was our next rider to compete, and having watched the other riders struggle to make the time, Micky wisely navigated Simply Mitch around the course to ensure no time was wasted. Having gone clear all the way to the second last jump, his Sat Nav battery ran out, but this did not phase the cool McHugh, as he calmly stopped and asked for directions before proceeding onto to the final jump. As the clock was ticking, the crowd were pehing (a strange Falcarragh word – ask Micky for clarification) in anticipation to see if Micky would clear the last jump and make it through the finish line before the 90 second time limit. There was a loud applause as the clock stopped at 89.80 seconds. As described from the horse’s mouth, or literally Micky’s mouth – quote “he vajazzled the spectators with his superb riding (and his jumping wasn’t bad either)”. Micky went on to ride a very good jump off but an unfortunate pole down kept him out of the ribbons. Rosaleen was the 12th competitor out of 20 to compete in the Advanced Intermediate class, and Santa Cruz Lady was the first Adv. 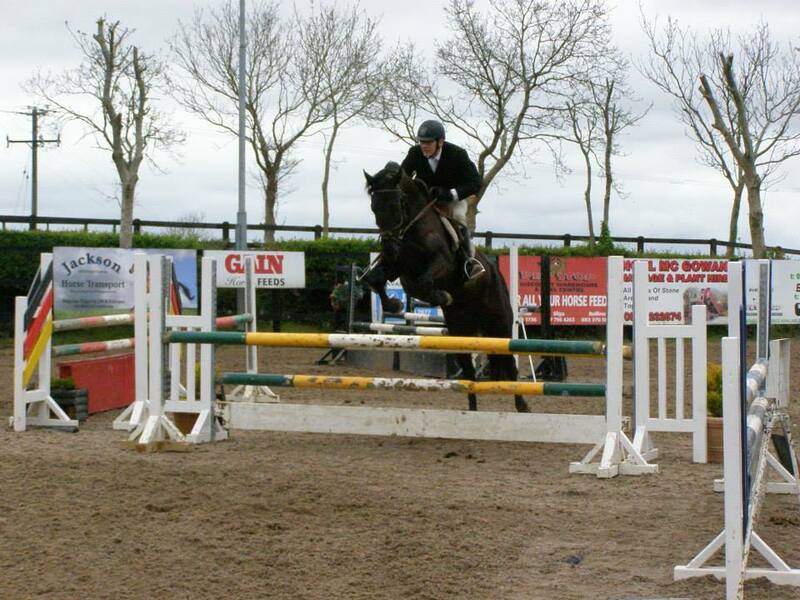 Intermediate horse to clear all the jumps, and one of only 5 in the class to clear all the jumps. Unfortunately Rosaleen’s Sat Nav went off course, and having rode past a jump she incurred penalties for having to rectify her route, leaving her out of the ribbons. John was next up and had a fantastic clear round, an unfortunate 1 time penalty kept him out of the jump-off, but a well deserved 3rd place qualified him for the Masters Series. There were no time penalties incurred on the journey home, as no one came near the maximum time limit for 3 minutes serious conversation. John, having decided he needs to build a special display wall for his ever expanding number of rosettes and trophies, was on the look- out for a Hardware Store, in order to get a plaster’s bucket. However as the day was longer than anticipated he was unable to find any hardware stores still open on the way home. If anyone comes across him walking about with a trowel in his pocket over the next few weeks, keep your buckets well out of sight!